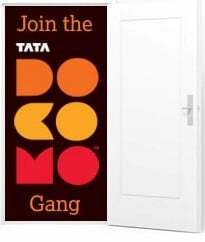 TATA DOCOMO, the GSM brand of Tata Teleservices Limited, today announced the commercial launch of its operations in Haryana, hot on the heels of its launch in Tamil Nadu, Kerala, Orissa, Karnataka, Andhra Pradesh, Mumbai, Rest of Maharashtra and Madhya Pradesh-Chhattisgarh. The company’s Next Gen GSM service started on a heady note, with TTSL Managing Director Anil Sardana making the first call on the TATA DOCOMO Haryana network to Mr Bhupinder Singh Hooda, Chief Minister of Haryana. TATA DOCOMO also announced a novel “Pay-for-what-you-use” model, with a pulse of one second, and a pricing of just 1 paisa per second. The company’s pan-India service rollout, which was kicked off in late June when South India and Orissa went ‘live’, will be completed this year itself. Introducing the One-Second Pulse—Local, STD & ISD. TATA DOCOMO also unleashed a wide array of products and services, riding on the back of path-breaking innovative products and services, & never-before tariff options. “We had made a promise that we would bring to the country products and services that would redefine the telecom experience,” Mr Anil Sardana said. “It is a privilege to be fulfilling that promise in the Haryana—where subscribers are discerning and seek transparency, innovation and differentiation. Our partnership with NTT DOCOMO will help us provide our subscribers with tremendous technological and service differentiation. Keeping in view the century of trust associated with the House of Tata, we are launching the concept of fare being fair. From today, TATA DOCOMO subscribers in Haryana will be able to enjoy the benefits of pay-as-you-use,” he added. NTT DOCOMO is acknowledged as the global leader in 3G technology and respected worldwide for its futuristic product innovations. “We are focusing strongly on network superiority, coverage and service offerings. Our network footprint is the largest among all telecom operators in Haryana, at the time of launch. We have already made large investments in the Circle, and further expansion in this financial year itself is on the anvil,” Mr Aditya Gupta, TATA DOCOMO’s Hub-head for Himachal Pradesh, Punjab and Haryana, said. “TATA DOCOMO will unveil a portfolio of Value-Added Services that will reinvent mobile telephony in India, with products and services like diet-sms, Free Voicemail, Timed SMS Service, Free Missed Call Alerts, Call-me Tunes, etc—all of them customized to liberate and refresh our subscribers,” he added. I have been TD customer since it started GSM operations in Haryana. Today TD completed 793 days in Haryana and I completed 789 days. If they hadn’t capped their 2G speed at 128Kbps, I would have been using their GPRS also. sir humara prime location mathura mein national highway no. 2 per 60by45 ka plot hai.or waha se agra ko jane wala railway trck 100mtr, mumbai jane wala rail track 80 mtr or delhi agra natinol hlghway no 2 50 mtr dur hai. Or waha per sabhi cell operater ka network kam hai or dur tak koi bhi tower nahe hai. Interested tower compney or cell operator apne tower lagane k liye jaldi contact kare.